Equip your RV with the added security it needs by purchasing the 7" Wireless Side View RV Backup Camera System. Even the most seasoned RV drivers know how difficult it is to change lanes in heavy traffic or back out of a tight parking space when operating a vehicle of this size. The 7" Wireless Side View RV Backup Camera System offers easy installation, brilliantly clear picture quality and immense flexibility. Use the four video inputs provided, allowing you to install up to four cameras, or take advantage of the unique ability to connect a DVD player or gaming system, guaranteed to be a huge hit with the kids! This backup camera system is both waterproof and incredibly durable, so you won’t need to worry that it can’t hold its own during rough weather conditions. With steel mounts and frames, these cameras are built to last. Even better, they offer an unparalleled view with full color and auto night vision. Swivel mounts for the side cameras allow drivers to position them just so. 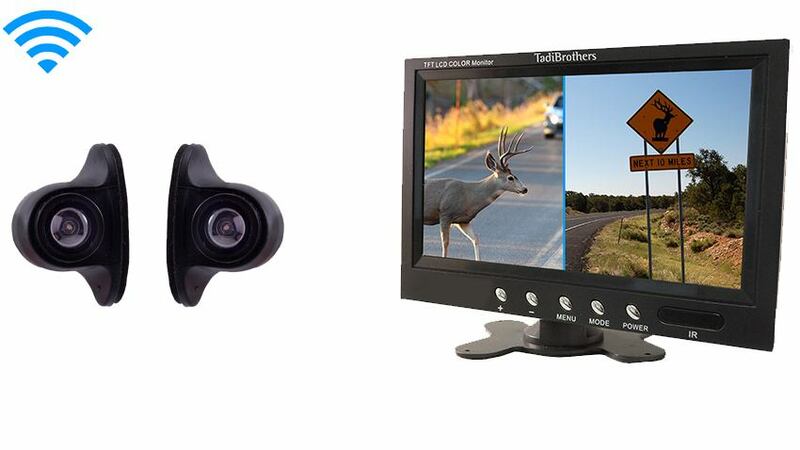 • Easily adaptable LCD split screen monitor can be used with any of our cameras. • Use included mount to attach cameras to your windshield or dashboard. • 7" Wireless Side View RV Backup Camera System makes driving easier. • Enjoy an extended 65-foot camera range with a 120-degree viewing angle, plus swivel-mount positioning on the side cameras. • The waterproof wireless camera offers full color and auto night vision, making it ideal for driving at night or day in all types of weather. • Add a front and back camera for complete comprehensive coverage. • We guarantee this is the single most reliable wireless camera on the market. By using the “CUSTOMIZE AND UPGRADE” section at the top right of the page, you can choose which style of backup camera fits your needs and budget. This system comes preconfigured with 2 cameras however, we have different styles for all kinds of uses. Change 1, both or none of the cameras in this system, choice is yours. Please use this guide to help you select which camera is best for you. These wireless side view cameras have a 70ft range that can go through any vehicle. Also, This system, like most of our vehicular products that have an LCD screen, can be used for video gaming, Considering that a perk or bonus for purchasing our back up system (others block that feature). The side camera has a 120° Degree viewable angle, its waterproof and has auto night vision. The side camera is perfect for any long RV or Bus. You can mount it on the side facing front or back any see everything in crystal clear quality. Do you need help parking? This is for you! Do you need help changing lanes on the freeway? This is a must! You can also add a FRONTAL camera and a rear camera to make it a 4 camera system!